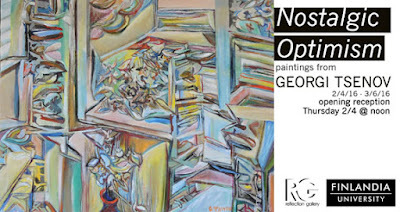 HANCOCK -- Finlandia University's Reflection Gallery in the Jutila Center, Hancock, will host an opening reception for the exhibit Nostalgic Optimism, paintings by Georgi Tsenov, at noon on Thursday, Feb. 4. The artist will be present and refreshments will be served. The exhibit continues through March 6, 2016. Artist Georgi Tsenov is a Bulgarian painter/educator living and working in the United States since 2009. He currently resides in Hancock. Tsenov holds a Master of Arts degree from Sofia University in Bulgaria. He has held solo exhibitions throughout Bulgaria, and the upper Midwest region of the U.S.
Nostalgic Optimism will showcase 33 of Tsenov’s paintings spanning four years of studio work. The work on display includes landscape and still life paintings, all employing heavy stylization and arbitrary color palettes. The collection of works draws on Tsenov’s formal training, while employing a sense of rebellion toward the medium. "My life in this nation has been the culmination of a lifelong journey and the fulfillment of my youthful dreams," Tsenov writes in his artist's statement. "My creativity has been inspired by my exploration of the northern Midwest. I am energized by the charm of the many small towns, rows of quaint houses, and beautiful harbors, ports, and marinas I have encountered. I was fascinated by my discovery of the local Native American culture. And perhaps above all, getting to know the local people has been my great pleasure. In short, this has been the long journey of a contemporary Eastern European artist. Otherwise stated, the wonderful discovery of America in forms and color. Particularly exciting for me is to share my discoveries through my art with the American viewer." The Jutila Center is located at 200 Michigan Street, Hancock. Call (906) 487-7375 for more information.